Merry Christmas to all the blog followers. I've taken the day off today, but worked on a painting of Gold Harbour yesterday. It's looking suitably stark, but I'm mulling over the possibilities of adding a bit more foreground interest, and will publish a photo soon. On the subject of blog publishing, I am totally confused regarding "google+" and suspect I'm missing out on a wider audience. Any tips appreciated, or spreading the circle wider! Ocean Harbour is a very impressive safe haven, accessed by a narrow entrance leading into a (relatively) sheltered bay. I say relatively sheltered, because the inner bay is dominated by the wrecked Bayard, A three-masted ship built in Liverpool. This was moored on the other side of the harbour, when it broke loose from its moorings in a gale, drifted across the bay, and was wrecked on the rocks where it now lies. Not much remains of the whaling station here, but it is nonetheless a very atmospheric place. I managed a very quick sketch of the Bayard before the rain set in heavily. Elsewhere, there is a steam locomotive, which excited Hergen, a German passenger, bits of track, and a lonely hut. 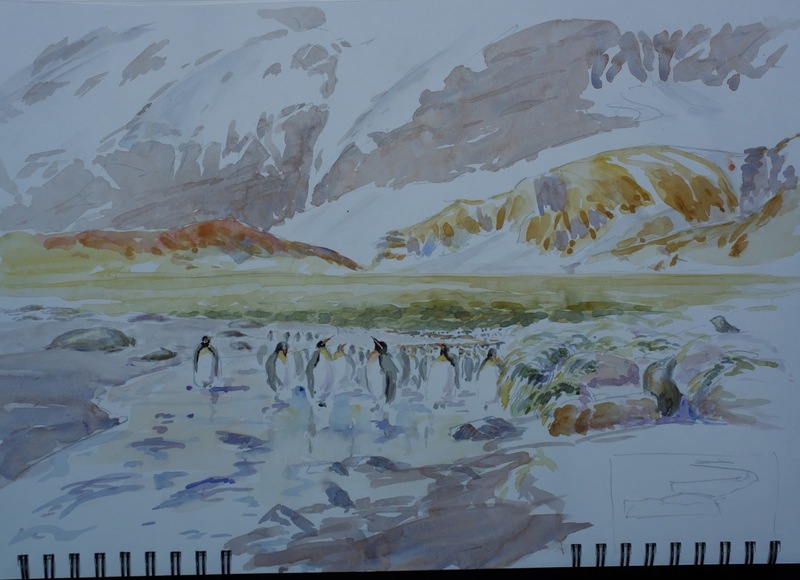 A group of penguins stood near a few poles, all that remains of some indeterminate structure, made a good subject which I hope to paint in the studio. 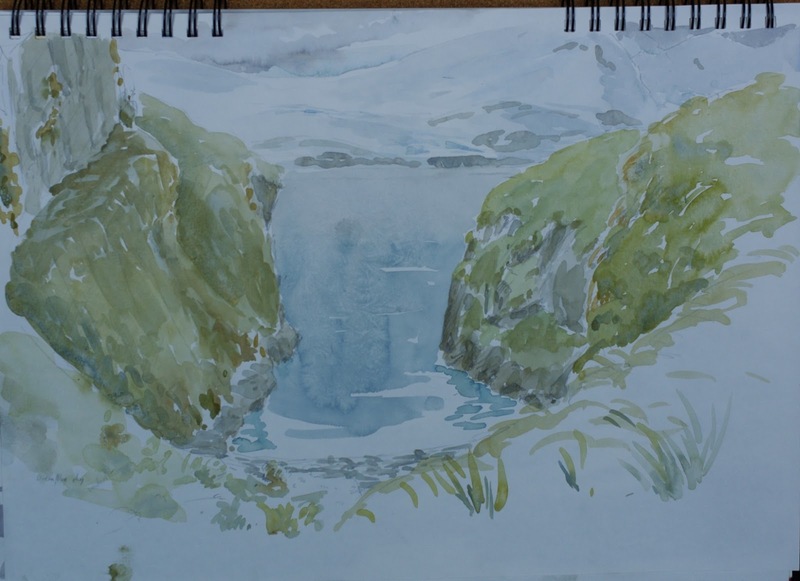 On the way out of Ocean Harbour, I did a quick painting of the rocky headland. I used coloured paper with quite a rough texture. It was interesting trying to capture snow and sea highlights -the whites- using this colour paper. Tones are all relative, and in the end the contrast between the bare paper and the dark indigo line of sea below the cliffs gave enough contrast to suggest breaking waves. 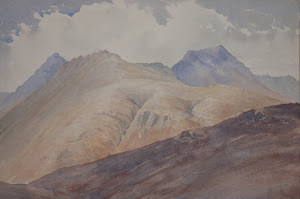 The background peak was done with a fairly thin wash of body colour, to suggest distance. The painting lacks foreground interest, but I don't want to ruin it with some black flecks suggesting birds. I may do a larger scale bird painting using this as a background which would be more compositionally satisfying for me. The paper, not being stretched, has cockled quite a bit, as you can see in the photograph. A bit of pressing should resolve this. 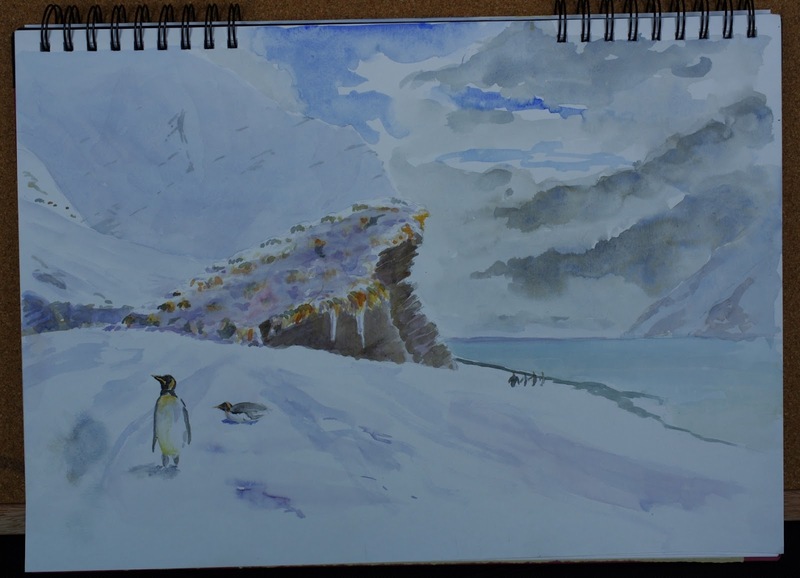 I've been working on a half imperial version of the sketch I made at Right Whale Bay. Like the previous painting, I felt that this would be an ideal subject for a larger full imperial sized painting. Having a handy stretched piece of paper, and not wanting to wait to stretch and dry a larger sheet, I made do with the half imperial sheet. 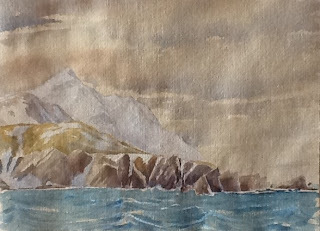 At the final stages of the painting, I darkened the background mountain, but am still undecided whether to put on another wash and darken it even further. At times like this I wonder whether I will ever resolve the dilemma between overworking a painting and not adding sufficient contrast to make it "ping". 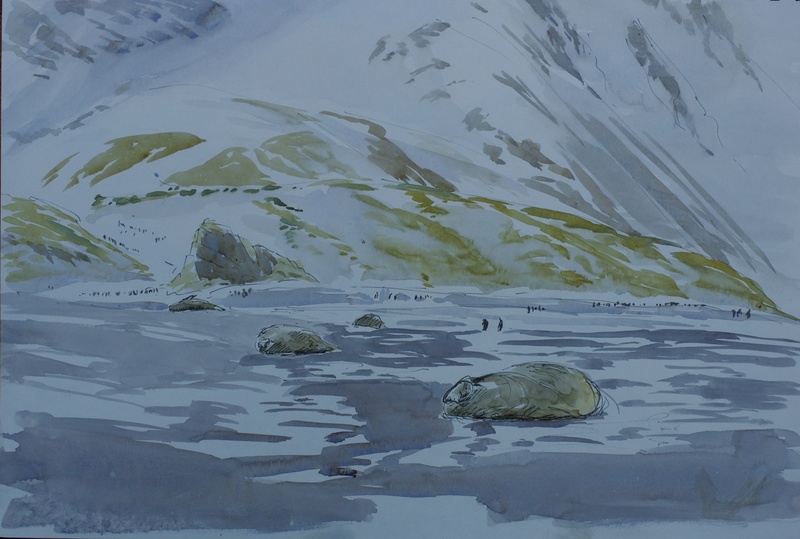 I have just completed a full imperial sized (22 x 30inches) painting based on the sketch I did at Gold Harbour; slightly different from the sketch as you would expect. 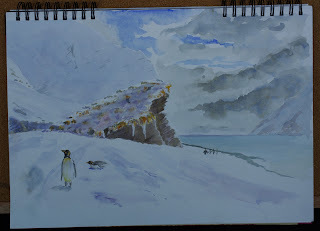 I wanted to keep the elements simple, to draw the eye to the foreground penguins . The large elephant seal, for example, was painted in one quick wash and I've tried to resist going back to do any more to it. 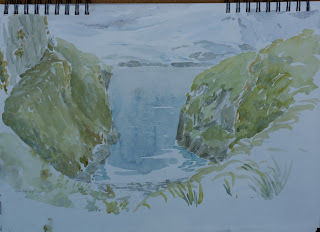 The photo is actually of the painting before I strengthened the area immediately in front of the tussock grass, but otherwise complete. A nice Christmas present for a South Georgia visitor? 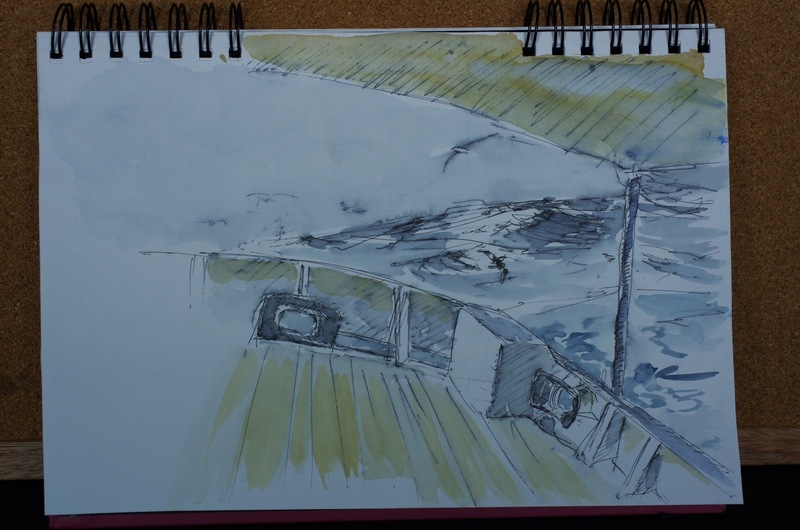 An hour or two visiting Right Whale Bay- my aim is to capture general impressions rather than complete a finished work, so with this in mind I use rotring pen for the elephant seal and penguin outlines. 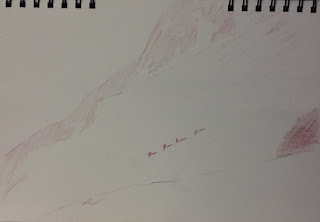 The snow- streaked foreground is done with one wash rather than trying to build in aerial perspective, but this is easy to do at a later date, as long as I have the basic tonal values. 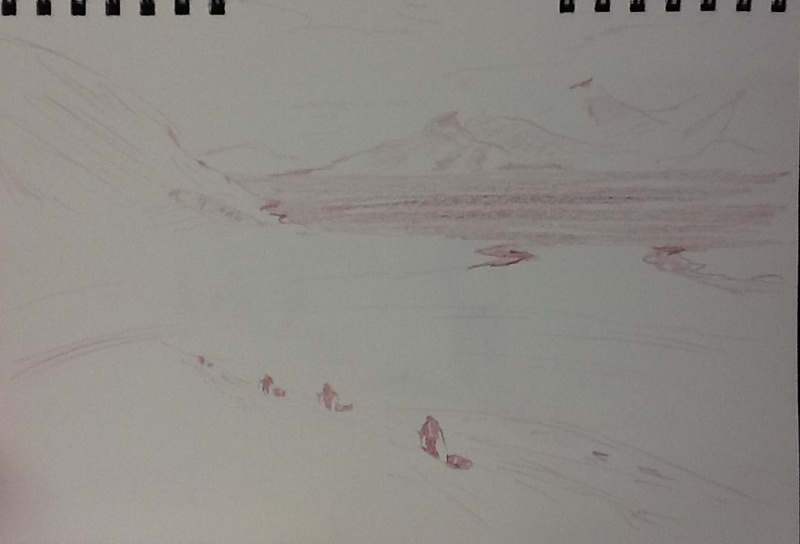 The top picture of the two above is at Gold Harbour; the lower sketch a brief sunny spell at Fortuna Bay. Dark clouds were building on the horizon, and we were quickly asked to head back to the ship. minutes later we were enveloped in a full-scale blizzard. Early morning, we cruise into King Haakon Bay, a large inlet on the western side of South Georgia's South coast. Everything is looking very wintry, although this is officially South Georgian springtime. Initially we land at Peggotty bluff, where Shackleton and his companions began the trek over the spine of the island to eventually reach help at Stromness whaling station. 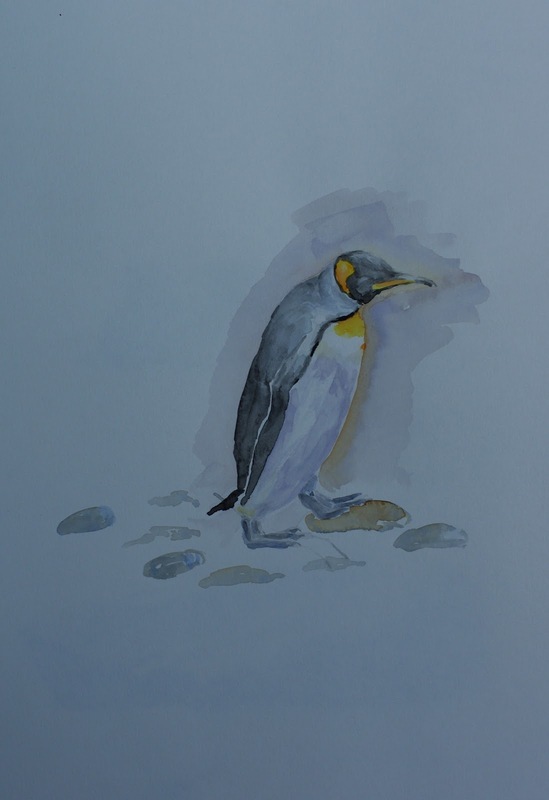 My first encounter with Antarctic wildlife- elephant seals on the beach, and a handful of King Penguins. 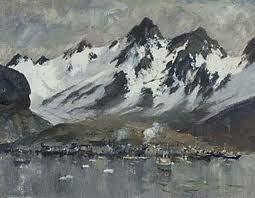 I set up the easel and try to paint the mountains that rim the fjord. Not particularly successful, as he temperature hovers around freezing, stopping paint from drying. Added to this, the wind keeps blowing the easel over. Later in the afternoon, however, we manage to make a rare landing at cave cove, Shackleton's first landfall after the epic voyage from Elephant island in the James Caird. I didn't attempt to complete the foreground tussock grass- there's enough information for a finished painting when I get back to the studio. Shortly after finishing the sketch, we were treated to a truly magnificent sunset, which I might try to capture in another painting. 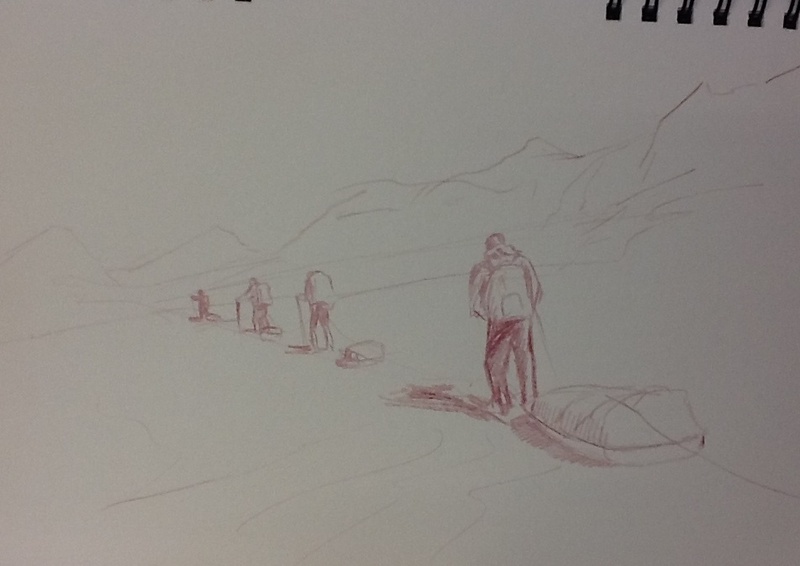 Also that day we drop off a ski party recreating Shackleton's journey overland to Stromness. All being well, we should see them again in a few days. Several days out from Montevideo, and the sea is still mountainous. Some wonderful lighting effects, and challenging painting conditions. 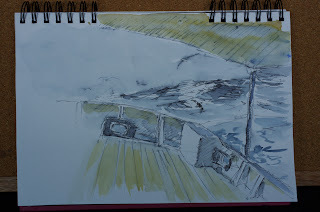 I wedged myself down in a (relatively) sheltered part of the foredeck and sketched the bow in heavy seas. 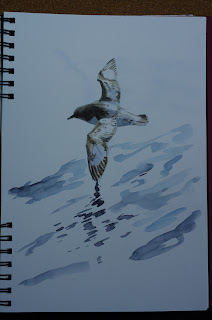 I used rough brown watercolour paper, about 140lb weight, and plenty of body colour for the white highlights. I was tempted again to do more on the waves, as there were so many breakers and whitecaps, but am happy with how it looks at present. I may still do a bit of work on the viewing platform at the bow, but am inclined to leave it for a while. One of the delights of the South Atlantic is the large number of seabirds that follow the ship. Since leaving Montevideo, one of the most abundant has been the Cape Petrel or Pintado. 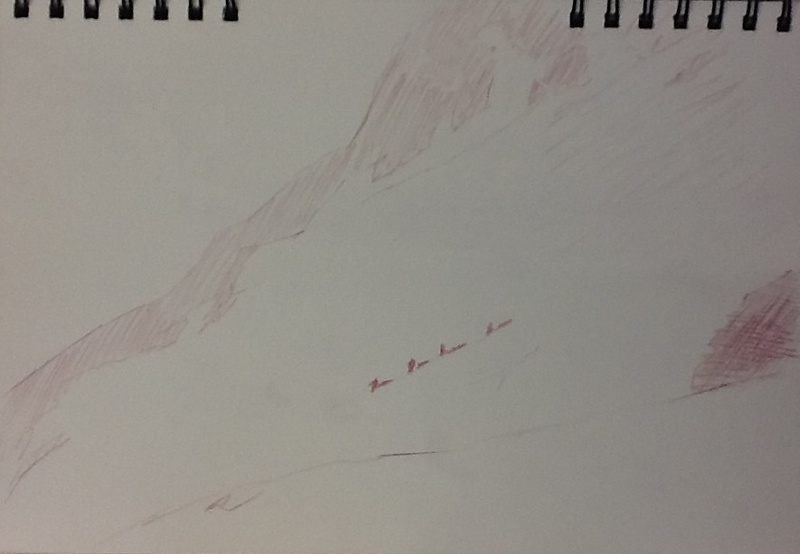 Very fast movers, I have struggled to get the proportions right. My first attempt didn't really succeed in this, and for the subsequent attempt I resorted to several photos to sketch in pencil and get a feel for the correct proportions before the watercolour sketch. First attempt- the body is too swift-like I feel. 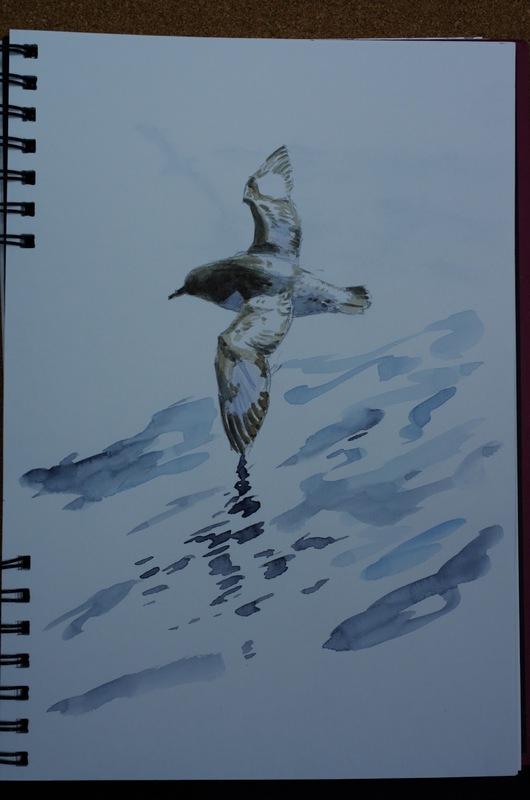 Attempt two- better proportions and showing the distinctive upper side markings. From the outset, heavy seas have been rolling in from the west, creating an uncomfortable rolling motion and making painting challenging. 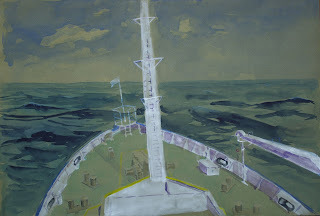 Large washes in particular are very difficult to control when paint, water and materials go flying. 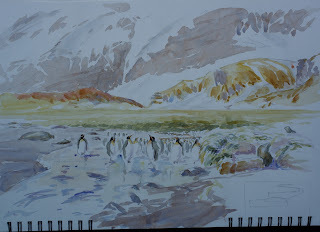 I've tried to cope with conditions by concentrating on sketches; plenty of pencil and pen work worth fairly dry washes. 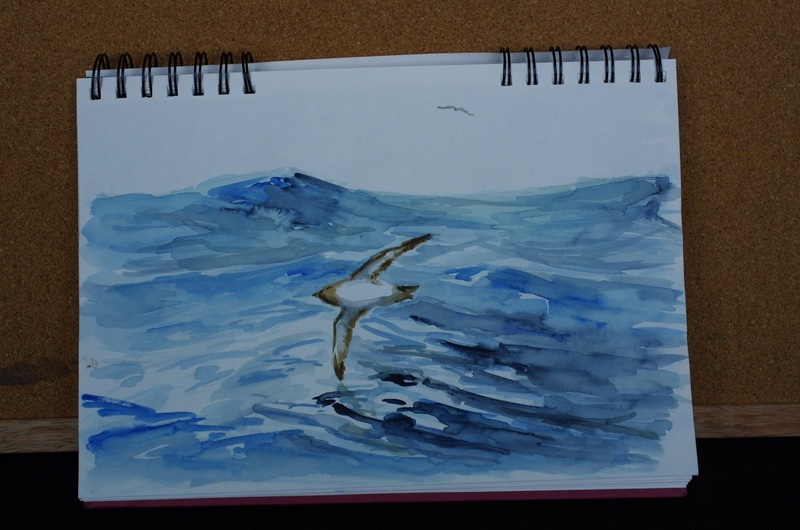 A quick sketch from the stern, looking at mountainous seas and following birds. 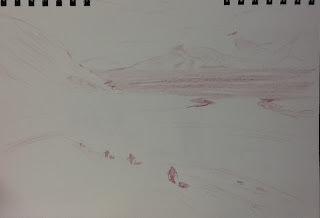 I used (unintentionally) a soluble ink pen, but quite like the effect this creates.